Are you in need of a low-maintenance vegetable garden to help you save time? You want to grow a garden but you don’t have time with your job. Or you’re super busy with a business and juggling a family along with it. Yes. If you’re desire is to grow a garden, there’s definitely ways to win in this endeavor. With a little bit of planning and consistency, I’ll give you some tips today to help you succeed even if you really do feel like you’re too busy. Brilliant gardening tips for the busy gardener who needs to spend less time doing the management stuff. We commonly know this term as “no-till” gardening. We practice this method, not just because it’s time saving, but it’s really great for building up our great garden soil. Why? Because when you are digging around your plants, believe it or not, you’re disturbing the community of beneficial microbes, roots, and other living organisms underneath. There’s ways I will mention below with weed control you can use to promote this no dig garden practice. You’re probably asking: “But I’ve been tilling and manually weeding for so long. How do I make a no dig garden?” Well, there’s several ways you can do it. Here’s how I do it. First of all, kill a spot by laying down a tarp, mulch or chemical. This will kill grass, weeds, etc that you can simply leave alone. You don’t have to do any thing after that unless you take a turbo till to work the ground a little. But you don’t need to. Soil test to see if you need to add nutrients to the spot. Here’s how to soil test and why you should. Next, plant your spot according to your vegetable garden layout plan. Make sure you water good after planting. The no-till spot should hold in moisture very well depending on what type of soil you have there. And that’s it. Your no-till garden is now established and you’re well on your way to saving time. The next tip is to plant a variety of plants in the garden to work for itself. The less you have to do, the better! And when I say “messy” I mean you have a multitude of different veggies, herbs, flowers, etc all the way throughout your garden spot. But, don’t worry. There’s a reason for this. 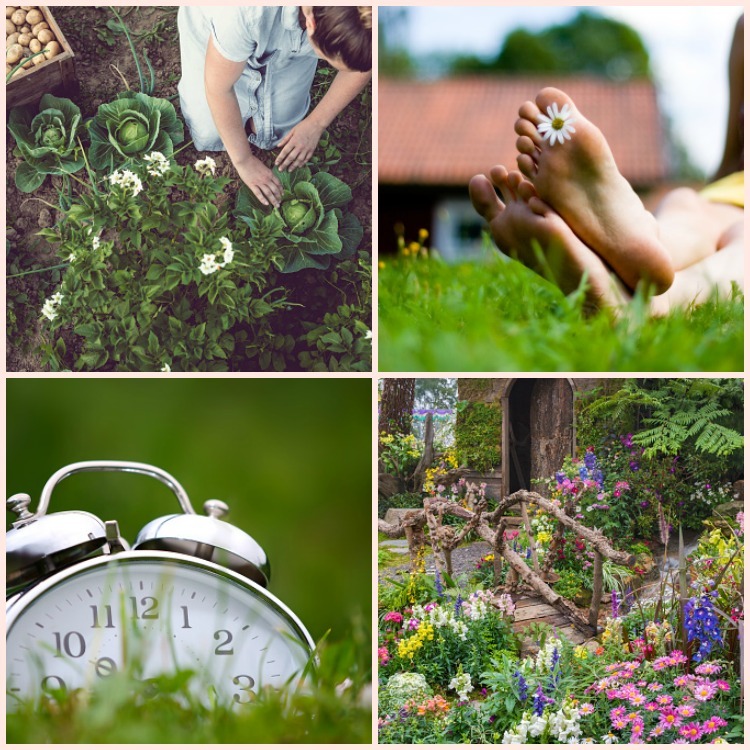 This process of messy gardening helps you to spend less time out there. Not only does it help build up the soil, but it also helps with weed and insect control as well. I’m talking about Cover Cropping, double cropping and crop rotation. These may seem like farming terms to you. Well, that’s because I am a farmer but I use my crop farming techniques on my garden as well. Cover Cropping is planting a crop on a bare spot that has been harvested to keep something live growing for soil microbes. Double cropping is growing two different crops in the same spot during the growing season. Crop rotation is rotating crops around from year to year. I like to rotate grass crops and legume crops for nitrogen fixing reasons. Companion Planting is the art of planting different crops together that will help each other. I have another article on Companion Planting that you should check out. It includes a cheat sheet you can print and use in your planning. For more info on companion planting, go here. Your garden may be a bit chaotic after all this. How to make a messy garden look good? Well, it simply takes a bit of planning and layout drawing to make it all work. I have another post about planning your garden layout that you might find helpful. It includes spacing recommendations for vegetable crops. Read more about planning your vegetable garden to keep it organized here. Along with planning out your garden and using low-maintenance techniques, you’ll also save time by choosing low maintenance food producing plants. These include plants that are native to your area. They will grow well without you babying them along. Maybe just a little fertilizer now and then, but that’s it. Potatoes – Read about how I prep my potatoes before I plant them. And it also depends on the timing of when you plant as well. For example, last season, I planted my cole crops (broccoli, cabbage, cauliflower) too late and they were growing during peak cabbage worm season. So, I was checking, picking and treating daily and it took up a LOT of my extra time and sanity. If I would have planted them earlier, I might have missed out on that. Here’s a read about cabbage pests and how to combat them. Whatever plants you plant in your garden, you should choose what you like. And there are ways to make growing anything easier even if you have to put a little work in at the beginning when you plant. None of the time-saving gardening hacks will be achieved if you don’t set it all up in the beginning. Set up your grow trellises when you plant. Mulch when you plant (for transplants only). Set up your watering system to where you just have to turn it on and go. These are all things that will take some time to assemble. But if you do it all when you’re in the garden, it’ll be all set up for the season. The next few rounds are some ways that have worked for me and my busy schedule to where I have spent very little time in my garden each day. I used to spend hours hand watering my gardens during dry spells. The year when I had two babies, I knew something had to change. I knew I just couldn’t spend that much time on watering. Insert, soaker hoses. One of the best vegetable gardening hacks ever. This is some investment cost up front but you can easily make that back in veggie sales if you have a large garden. Your garden needs water and often times, there’s not enough time in the day to water. A soaker hose set up is extremely easy and very low maintenance. Yes, you’ll need to make sure the hoses are leaking where they should be, but you’ll get a a nice slow water at the ground level that your plants will love. Purchase the same no-brainer soaker hoses I use here. You water at the ground level so no water on your foliage. It can work in your schedule if you’re gone all day. The best time to water is in the early morning or late evening. This was a no-brainer for me. It saved me so much time to devote more to my babies and other things than standing there spraying my large garden. Another job I was spending too much time on was weeding. Another one of those life hacks for gardening and saving time is easy weed control. Weeds are not good for your crops and flowers you’re growing in your garden. But you can set up a system at planting that you won’t have to weed through the season at all. I started this the same time as the watering system. Because I didn’t want to spend hours weeding the garden every night. I wanted to spend more time playing with my kids. Way too much work! Mulch – We just used a mix hay of what we already had. You can also use compost and straw. We laid out the black plastic, planted transplants in and then mulched on top. I didn’t have to weed the entire season and my plants produced great because they didn’t have any competition from the weeds. Companion planting can deter certain pests away from certain plants. Also, incorporating beneficial animals into your garden can help deter pets, such as bunny rabbits. I’ve also put up fencing around certain crops bunnies like as a way to keep them out. I know many large gardeners who trap animals or use dogs to keep them out. My husband’s aunt hangs Wal Mart sacks to keep deer away from her asparagus. There are several ways to keep animals and pests away. Again, several of these tips can be set up ahead of time but you still need to be monitoring and checking. Like I mentioned above, plant vegetable crops around peak pest seasons. I should have planted cole crops early and I will this year. I crop scout my gardens every morning by just walking through and observing the foliage. Look for missing leaves or leaves with holes and act according to what you see. Read about my experience with green tomato horn worm. Interested in Beneficial Wildlife to control Harmful Wildlife? Click Here! Read More about Harmful Wildlife and How to Control them Here. 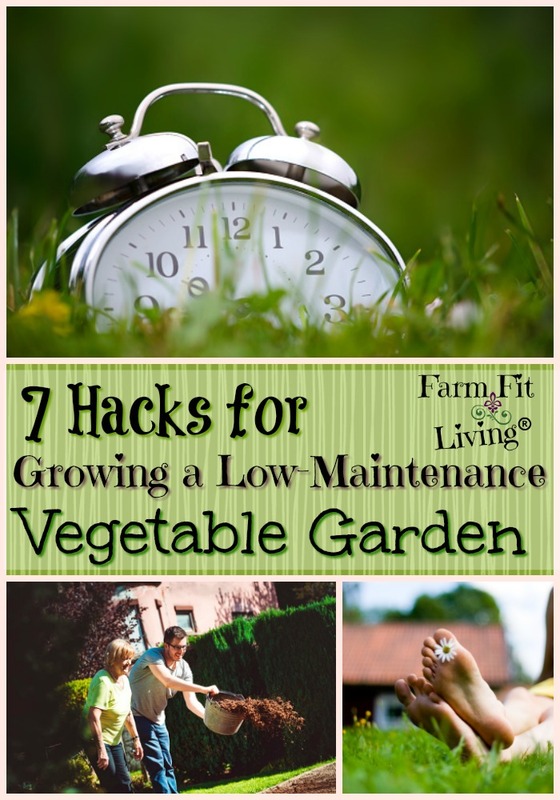 The best simple gardening tips all come down to this: No matter where you are or what you do, you have time for growing a low-maintenance vegetable garden. Planning and setting automatic methods up ahead of time are some of the best hacks for the busy gardener. Also, I’ve found working with nature to be very beneficial and time-saving as well. If it’s a rainy season, you don’t have to turn those soakers on. Let nature water your garden. Plant certain crops before a big insect or disease time. And plant small. You don’t have to have a huge garden that you don’t have time for. If you just have small containers or raised beds, that’s great. 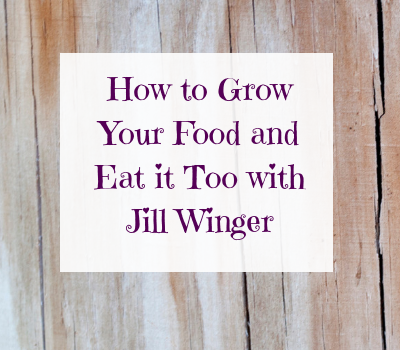 You can still use the same growing methods I’ve discussed above – they are brilliant gardening tips I’ve learned over my many years as a gardener. I hope you found some value and best garden tips and gardening ideas you can take back to your garden with you. What are your best tips for growing a low-maintenance vegetable garden?